Fireweed in bloom creates a sight of striking beauty. The fields of its majestic purple flowers could be seen in summer in northern latitudes from Alaska to Nova Scotia and from Northern Europe to Siberia. It is a floral emblem of Yukon and it is considered the national flower of Greenland. In different languages and dialects it has many beautiful names. The common name “Fireweed” derived from the German “FEUERKRAUT”, which was given to it in 16th century for its ability to flourish on ground, destroyed by fire. Fireweed has a rich history of use as both food and medicine. Its shoots and roots were a nutritious native spring food, containing significant amount of Vitamin A, B3, C, as well as being an excellent source of both calcium and magnesium. It was eaten raw or as a potherb, boiled into thick sweet wort or steeped fresh or dry as tea by our ancestors. Early French settlers called the young shoots of fireweed “Asperge”. They steamed them like they did asparagus. They also used its delicate purple flowers fresh in salads, and pickled unopened buds instead of crapes. In fact, today in Europe, fireweed remains a popular vegetable. Even more extensively fireweed was traditionally used as a medicine. The Haida people, the Cheyenne of Montana, the Woods Cree of Saskatchewan, the Dena’ina of Alaska, the Chukchi of Siberia, peoples of North Europe all cherished fireweed as a powerful remedy for all sorts of gastrointernal problems, internal parasites, colds, headaches and insomnia, as calmative, and as a first and the only aid for cuts, bruises and wounds for fast healing. 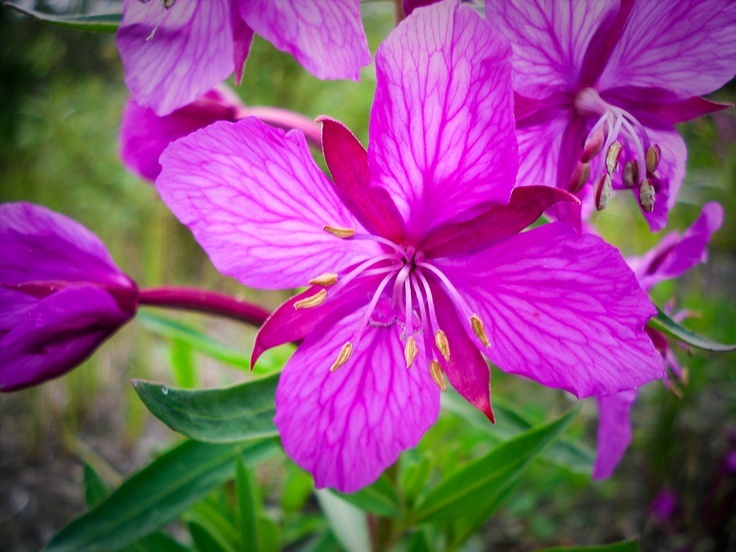 The recent numerous scientific studies on fireweed medicinal properties have shown exciting results. Fireweed anti-inflammatory properties have been clinically proven to be stronger than cortisone in relieving skin irritations and exema. Glucoronic acid present in it have been proven to be therapeutic for arthritis and rheumatism. Its antiseptic properties and high mucilage presence makes it a gentle, yet affective remedy for relieving all sorts of gastrointestinal and stomach inflammations and high tannin content explains its mild laxative effect. Several studies have found oenothein B in fireweed, which is an active compound that inhibits the human prostate grouth and posses anti-viral and anti-tumour activity, and has antioxidant activity equal to vitamin C.